Young Alice discovers she has "absolute taste," an ability to detect the faintest of ingredients in food - and a passion for Paris is born. But first, she has to grow up. Annoyed by the loud crunch of her sister's morning bread routine, Alice sets out to find a bakery that makes silent bread. Needing a job, Alice looks to put her sensitive palate to work as a food critic, but does she have what it takes? After a butcher refuses to sell Alice's sister's friend Charlie a meat pie made for a world championship, they set out to get it - no matter the cost. After a fight between Elsa and her boyfriend, it's up to Alice to cheer her up - until they discover him with another girl. 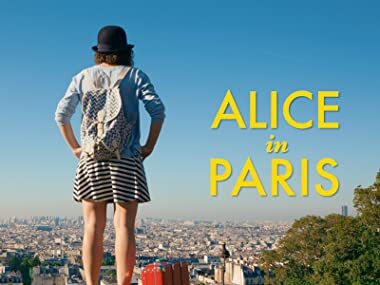 To become a food tour guide in Montmartre Alice must first defeat the current guide in a culinary battle of wits. After discovering Alice has absolute taste, Charlie begs her to train him in her ways to make himself a better chef. With Elsa still not over her breakup, Alice sets out to help her heal - by creating a secret admirer. After her lemon pie goes missing at a party, it's up to Alice to discover the culprit. But who could it be? 10. Shared Vision of Love? With Elsa on a mission to meet her secret admirer, how does Alice convince her to break it off? Having missed numerous opportunities to kiss Charlie, Alice plans the perfect date night. The only problem - so did Charlie. 12. Elsa and Her "Admirer"
Still obsessing over the identity of her secret admirer, Alice hires an actor to take Elsa out. When Elsa and Vincent go on a second date together, Alice does her best to try and break them up. After lying to Elsa about her secret admirer, Alice does what she can to apologize - in her own special way. While in Nice, Alice decides to visit a candy factory for a chance to take a photo that will get her more followers on Instagram. After the wind tosses Alice's picnic basket into a lake, Alice has to take to the water to get it back. While staying at her aunt's bed and breakfast, Alice is tasked with making pies while watching her four younger cousins. Getting work as a delivery person, Alice has to make it across Paris in 30 minutes with a very special package. After kissing Charlie, Alice was left with a bad taste, the taste of friendship. But can she fix it? After forgetting the cheese for their annual post-Christmas meal, Alice gets the chance to win a wheel of raclette if she can only answer every question correctly. Despite a rocky second date, Elsa and Vincent are now dating, and that has Alice suspicious. Alice heads to a museum to discover her artistic talent only to find inspiration elsewhere. At a ski resort in the Alps, Alice attempts to break all her records, even if it takes a few shortcuts. Alice is on a mission to discover the secrets of one of the world's best chocolatiers. Having written down a 62-step guide to happiness as a child, Alice takes it upon herself to check every box.